Our Arrival in Osaka was rainy, but still exciting – they had a high school band playing and lots of kids were out to see the big boat pull into port. One thing that set Osaka apart from Sendai, Hakodate and even Tokyo was the development of the Pier area. Literally STEPS from the ship there was a huge ferris wheel, the best Aquarium in Japan and a shopping mall to boot. On the first day in Osaka, I went to the Aquarium and at night went up on the huge Ferris Wheel where we got an amazing night time view of the Mariner. While the Whale Shark is the star attraction at the Osaka Aquarium (“the biggest fish in captivity”), I was entranced by the school of silvery sardines that swim in a huge school in an endless loop around, around and around. It was mesmerizing to watch. One of the thrills of visiting Osaka was to finally Visit Daimon Sake Brewery. Daimon-san makes the world famous Mukune brand of sake and is also well known for sponsoring a sake brewing internship program starting in 2009. Daimon-san greeted us personally at the gate and beautiful entrance to his brewery. Lucky for us there was a local craft fair being hosted that day in the Brewery, so we got to see some beautiful crafts along with our tour. Daimon-san walked us around the brewery and showed us where the rice was washed and steamed, where Koji was made using advanced technology and where the Brewing tanks and sake pressing were done. The overall feeling was of a true artisanal brewery. After the Brewery tour, Daimon-san invited us to have lunch and sake at his restaurant located in the brewery called Mukune-tei. The Restaurant is small but wonderful with a wonderful course menu of simple, honest home cooked style meals. At this point we also sampled some Daimon Sake including a divine Shizuku, some fall nama and wonderful Junmai Ginjo sake, too. As we finished up our meal and bid farewell to Daimon-san, I felt so lucky to be enjoying such wonderful food and sake in such beautiful surroundings. Getting out to the countryside on our own was quite an adventure and now we had to do it all in reverse. The Adventure never stops in Japan. Very special thanks to Daimon-san for such wonderful hospitality and for welcoming us so graciously. I hope I can return and visit again! In New York City we are super lucky to have a great and authentic Takoyaki stand on 9th street. I love it. Well, now I found myself in the home of takoyaki and I had to test how they tasted in Osaka. The final report? What we can get on 9th street is super realistic and just as good as the Osaka Street vendors… and it saves you the airfare. I was lucky enough to be invited to a sake party at a wonderful Osaka restaurant. My host was Mr. Sano who runs a well known Sake retail website called Jizake.com. Now, Sano-san really hooked me up. He arranged for dinner at Takochaya, a well known restaurant that specializes in Octopus or “tako” in Japanese. The owner is also known as a sake fan. I actually really enjoyed the squirming octopus and everything I ate at Takochaya. Sano-san is a huge sake fan and a wonderful person, too. I was happy to meet him on this trip and some new sake friends too. I literally cannot wait to get back to Japan on another sake adventure! Until then – Kanpai one and all. As we slowly docked in Tokyo Harbor, I heard this odd noise off in the distance. As we drew closer, I saw clearly that there were live Taiko Drummers stationed on the dock to greet us! It was a very memorable welcome ceremony and I couldn’t wait to get off the ship and start exploring Tokyo! The cruise company provided a shuttle but that took us from the dock to the Ginza shopping area. When I heard they were dropping us in Ginza, I got all excited because I what was there – one of my favorite sake tasting bars! One of my first stops off the bus was to stop into Fukumitsuya Sake Shop and Tasting Bar. This place is amazing and I’ve loved it since my first visit here in 2008. The style of the shop is clean, elegant and modern. They have a shop that sells Fukumitsuya brand sakes such as Kagatobi and Kuro-obi along with artisan made sake carafes and cups. In addition to the retail side, the shop also features a tasting bar to sample sake and snacks. Since it was before noon, I sat down at the bar and looked at the snacks they offered. Turns out they offer a Sake infused ice cream served with a shot of rich, aged koshu on the side. I was skeptical, but the pull of ice cream was too much to endure so I went for it. Turns out the ice cream was delicious, but the Koshu on top was utterly fantastic and turned this little treat into the breakfast of champions. After a little Sake Ice cream powered shopping spree, I headed off on a a little urban safari hunting for the elusive tokyo cup sake. Anyone who knows me well knows that I love sake, and that I really love cup sake. All my research indicated that there was a small but hard to find sake shop that specialized in cup sake… and come hell or high water, I was going to find it. After a lot of help from a local resident and a little boost from Google maps, we arrived at Ajinomachidaya Sake Shop. The shop is small with a real neighborhood feel and crowded to the brim with delicious sake. I introduced myself to the owner Mr. Kimura as a sake samurai on the hunt for cup sake and he showed me his wall of refrigerators dedicated to cup sake as he welcomed us very warmly indeed. Kimura-san obviously has a true sake spirit and quickly broke out some samples for us to try as well as giving us a tour of his reserve sake refrigerator for his super premium brews and his large storage space for all the remaining sake, cup sake and shochu. I picked out about 12 sake cups to take with me. As I don’t do so well with the Kanji, i’m not 100% what I ended up buying but I stuck close to Kimura-san’s recommendations. I loved this little sake shop and look forward to the day that I can return. As we bid Kimura-san goodbye, I was looking forward to one more big tokyo adventure! Day 2 in Tokyo, we found ourselves meeting up with Etsuko-san of TokyoFoodcast fame to trek to the outskirts of Tokyo to visit that one of that prefecture’s most famous breweries: Sawanoi. We were met at the Brewery by Mr. Masaaki Kodama, Director of Sales who gave us an extensive tour of their impressive facility. What strikes you first upon visiting Sawanoi is the extreme beauty of the setting. The Brewery is nestled on a hillside with a shop, famous tofu restaurant and picturesque view of the valley with a tranquil stream. Across the quaint bridge is a Shrine built on the opposite hillside. It’s idyllic, charming and very well worth a visit. Kodama-san started our tour in the brewery area with a visit to the unique and state of the art rice steaming and cooling machine. It made it clear from the get go, that Sawanoi makes their sake on a larger scale than smaller breweries. Everything at Sawanoi was impressive and Kodama-san was an expert tour guide to the facility. Along with all our delicious food, we were gifted a bottle of Sawanoi Souten Junmai Ginjo Nama Sake. This sake was flowery and fresh with a delightful sweetness on the palate. It made a delicious match to the tofu dishes at Mamagotoya. As we bid farewell to Kodama-san and headed back to the train and to the ship, I took a moment to look around and take it all in. I wanted to truly appreciate everything I had seen at Sawanoi. What a fantastical place. My special thanks to Kodoma-san and Sanwanoi for receiving us so kindly and for all their hospitality, which I won’t soon forget. Next it’s back to the boat and on to Osaka! I’m looking forward to the sake adventures that await in that city. This morning I woke up as the Seven Seas Mariner was pulling into the harbor at Sendai located in Japan’s Miyagi Prefecture. Downtown Sendai City is actually about a 45 min drive from the industrial port area where we had docked. Most guests were on their way to tours and excursions, but I was leaning off the ship’s balcony looking for someone. I was very lucky to be meeting Mr. Koichi Saura, President of the sake brewery that bares his name and also makes the world famous Urakasumi brand of sake. I have met Saura-san before as he prosided over the ceremony in Kyoto where I became a Sake Samurai in 2007. As luck would have it Saura Sake Brewery, located in Shiogama town is only a 20 min drive from the ship’s pier, actually much closer than downtown Sendai itself! As I climbed down off the gangway, Saura-san was there to meet me on the pier and I was so happy to see him again and of course looking forward to seeing the home of delicious Urakasumi Sake! The Saura Sake Brewery is nestled in the middle of Shiogama and is a picturesque place. After some tea, Saura-san began the tour of his beautiful brewery. First, I saw his newly built office building that had an entrance way that was made from a reclaimed section of a temple that would have otherwise been lost. It’s absolutely stunning and I think this demonstrates something I saw time and again at this Kura – Saura-san is someone who, however far away his sake travels in the world, cares deeply about his local community and home town. Beautiful! I think this caring and focus on community come across in the honest and pure flavors of Saura-san’s delicious sake. We started the tour with a few of the room where rice is soaked and steamed. The set up was designed and fabrication directed by the previous Toji (master Brewer) and was an ingenious system. Next onto the koji room which at Saura Brewery is lined with Japanese Cedar (sugi). The area where the sake yeast starter (moto) is made, introduced me to a new contraption that is plunged into the moto to chill it – it looks like a star shaped ninja sputnik radiator. Very cool, Mr. Moto! In the brewing room, I was able to see Kurabito (brewery workers) stirring in additions of freshly steamed rice into the big brewing vats. Saura-san also introduced me to the sake pressing area where sake and lees part ways. This brewery had a beautiful old wooden fune and a stunning giant wooden lever as big as a tree that was once used to press the sake by hanging a large stone from the far end. Saura-san then let me taste 3 of his fantastic sakes that were really stunning. He was kind enough to provide a spittoon, but I declined to make use of it as I wanted to really drink & experience all of them! Urakasumi Hiyaoroshi: The Fall Nama hiyaoroshi was plump and delicious with hints of plumy fruits and really delicious. Urakasumi Junmai Daiginjo Koshu: Ding, Ding, Ding! We have a winner!! OMG, this sake knocked my socks off. It’s a limited production run of a delicious Junmai Daiginjo that is then aged at a very cold temperature for at least 3 years. The flavors literally danced on my palate – complex, smoooooth, elegant and deep: I’m in love. Urakasumi Zen Junmai Ginjo: This sake is the Urakasumi brand flagship and understandably so. It has wonderful structure and balance. Accessible with hints of rice, it’s a wonderful sake for beginners and serious sake sippers alike. It’s hard not to like this brew. Saura-san then took me to see Shiogama Shrine which is one of the largest in the area and is a big attraction for this area. 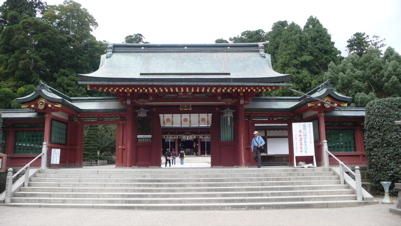 One way to enter the shrine is up 200 stone steps that lead directly to the main building. Luckily for me, in interest of my need to get back to the ship before sailing time, Saura-san drove us to the shrine. This shrine is stunning and one of the oldest in northern Japan. It has beautiful views of the city and bay and it even has a special area near the parking lot where you can get your new car blessed! I was lucky enough to see this ceremony in action. I also bought an “omamori” or Shinto amulet (good for one year) from Shiogama which will ward off bad luck and which I will carry with me in my bag until it’s time to get a new one next year! After such a wonderful afternoon, it was time to say goodbye and Saura-san wisked me by car past the most beautiful Miyagi views on the way back to the ship. My most sincere thanks to Mr. Saura for his wonderful hospitality and for welcoming me to his Brewery. When I was back on the boat and we were sailing for Tokyo, it was time for a special onboard event. I was asked to present sake at a special Japan-themed cocktail party aboard the Mariner. At this pre-dinner event for select guests, I gave a short speech to introduce myself to those I hadn’t met in the seminars, explain a bit about sake and explain my fancy kimono getup! Daniela is the Mariner’s delightful Head Sommelier. Dedicated, hard working and also a big sake fan, Daniela help tremendously in encouraging the guests to enjoy some super premium sake. I think everyone did! Thank you Daniela! I had a lot of questions from the guests about my kimono. ( I dressed myself – how’d I do Hiro-sensei?!!) Many people asked me about my “haori himo” or puffy white pompom string closure for the haori coat. Kanpai Japan! Today the Seven Seas Mariner landed in Japan! Specifically the charming city of Hakodate, on the large northern island of Hokkaido. My first views of Japan during our sail in were of stunning Mount Hakodate in the morning rays of the sun. It was a beautiful day and the seas were teaming with ships. A small fire boat set off it’s water cannon in salute as we approached the port of Hakodate. After overcast skies and rocky seas of the Bering Sea, Hokkaido loomed beautiful and welcoming . Hakodate is famous for two related things – it’s charming morning fish market and “Ika” a.k.a. Squid. Just a few steps from the main train station, the Asa Ichi morning market was indeed charming with lots of vendors selling just about anything you can pull from the oceans around northern Japan. Lots of crab, fish, uni and of course, the star of the show, Squid. Squid was really everywhere. Manhole covers had squid on them, buses and department stores had laughing and smiling squid cartoon mascots and large tanks outside many stores held pens of darting and flapping live squid on display. One of the more unbelievable squid creations I saw on this trip was a dried squid tokkuri (sake carafe) and sake cup. Fashioned litteraly out of dried squid, the vessel is meant to be filled with hot sake that will infuse with the taste of squid and then, to top it off, you can eat the tokkuri, ala a Willy Wonka tea cup. Since I was coming to Hokkaido for the first time, my thoughts wandered to some Hokkaido sake friends I met. Carlin-san and Rie-san both work at a fantastic Sake shop in Sapporo, Hokkaido called Meishu no Yutaka. I didn’t have time to visit them in Sapporo, but they were kind enough to introduce me to a sake shop in Hakkodate. I took a taxi out to “Sake Boutique Echizenya” and met the kind owners of the shop Hisashi and his wife Takako. They introduced me to their sake selection and made recommendations on what I could bring back to the ship. I bought several types of sake with them and was amused to discover a “New York Style” sake tonic mixer from Fukumitsuya. I had to get that! The sake selection at Echizenya was curated and elegant with a strong showing of Hiyaoroshi (fall nama sake), given the season. Hisashi did a great job at explaining his recommendations and I did my best to talk to them in my broken Japanese. My luck turned when another customer turned up who had lived for two years in the states and spoke fluent English! This allowed us all to communicate more freely and was really wonderful. Everyone was so kind, I was just delighted. Thanks to Rie, Carlin and all my new Hokkaido sake friends who helped me enjoy such a wonderful afternoon on my first day in Japan this year. I’ll be back! I can’t believe it, but today is already my last sake seminar for the voyage. It’s also our last full day at sea before we reach Japan. For the final seminar I decided to focus on Sake History. It’s a vast topic that only allows the most superficial exploration in the course of an hour or two, but I think it’s well worth exploring! This history of sake goes back thousands of years and ties intricately into the history of Japan itself. Once used as a way to commune with the Gods, sake has long been revered and holds a special place in Japanese society to this very day. My Seminar explored how sake came to Japan and how it moved from use during religious ceremony into everyday life and commerce. We also discussed how the sake industry was brought to the edge of destruction during the Second World War and how sake came back and expanded in the late 20th and early 21st centuries to gain a loyal following again in Japan and beyond. The Kimoto sake we are tasting today represents the traditional Kimoto method that was used for hundreds of years in Japan. Without understanding and appreciating Kimoto, we miss a huge piece of what sake is. Next we tasted a taru or cedar-aged sake. This style is a very nostalgic taste for Japan. Cedar barrels was used for centuries in Japan to brew and store sake. Undertanding taru gives us window into Japan’s past. I included a modern, clean and pure sake such as Wakatake Junmai Daiginjo as a part of Sake history to demonstrate how far sake as come with rice milling and modern brewing methods to create the sakes we know and love today. I’ve absolutely loved working as a guest lecturer on the Seven Seas Mariner. This really was a once in a lifetime cruise. I’m so grateful to the crew and the beautiful guests who learned to share my love for sake over the last 10 days. It’s been a joy to drink and discuss sake with you. Now – it’s on to Japan for up close encounters with sake. Next stop: Hokkaido. Today was the sake tasting that I call “a walk on the wild side” of sake. We tasted 3 super funky brews that will surely widen your view of what sake can taste like! Beyond the standard brews, there are may alternate production methods that offer unusual tastes and unique flavors! Today I talked to the class about unique yamahai and kimono sakes, which use a natural yeast starter to gain a funky edge; Sparkling sakes that surprise the palate and Koshu sakes, which are naturally aged and a study in richness. These what we could call ‘fringe’ style sakes engendered a fair amount of discussion. I heard some absolutely loved the bold, rich sherry-like Koshu, but some found it challenging. It was the same story for the tokimeki sparkling and sweet, low alcohol Karen Coy. Actually, I was happy to hear this because one of my main goals in this series of seminars was to encourage guests to develop their own sake palate. Tasting some more unique flavors such as these really helps people zero in on those tastes, flavors and textures that appeal to each person individually. The fun an interest of today didn’t end at the end of the sake seminar eitherâ€¦ Tonight was also one of the ship’s “formal” nights. This meant that after 6pm tuxedos or dark suits are required for gentlemen. Now, this wasn’t something we usually do, but it was fun to get all dressed up and head out for drinks and dinner. The Seven Seas Mariner has four restaurants and two cocktail lounges so there is aways a place to go. Scott and I started the evening at the “Horizon Lounge” which is located on the aft section of the boat, deck 6. It has a great view of the churning water that the powerful engines produced as the Mariner powered through the water. Horizon had a dance floor and stage and often had live music for cocktails. By far our favorite music on the ship was the Natural Rhythm Trio. They were three guys who respectively played bass, rhythm guitar and lead guitar each taking turns singing. They were all great, but the bass player had a really amazing voice and we enjoyed their performances a lot. They played lots of classics and standards and one song we heard often was My Funny Valentine. Moving on to our formal night dinner, Scott and I dined at Prime 7, which as the Mariner’s top notch surf and turf restaurant. As we recently left Alaska, I went for Surf and was rewarded with TWO pounds of the most delicious king crab legs I’d ever had in my life. Life is good! Tomorrow will find us sailing the Sea of Okhtsk (try saying that three times fast) and will also be my final sake seminar before landing in Japan!! We’re almost there!! I’ll admit I approached today with a bit of trepidation. Coming of age in the cold war 1980’s, films, TV and even the President infamously portrayed the USSR as the “Evil Empire”. 30 years and a cultural revolution later, I didn’t know what to expect of my first visit to Russia. Sake Cruise ’09 sailed into the Siberian port of Petropavlovsk located on the Kamchatka Peninsula. The of the port looked stunning as we arrived. Petropavlovsk has incredible natural beauty. With three active volcanos and sweeping low mountains, the city created a charming backdrop from the boat as we enjoyed breakfast onboard the ship. After we were cleared for tendering ashore, Scott and I decided to forego any organized tours and strike out on our own. Scott lived for 4 months in Leningrad in the 1980s and his language skills speaking russian proved invaluable during our hours on land. Our first stop was at the monumental statue of Lenin that dominates the town’s main square. Every Soviet Union town had one and I guess the folks of Petropavlovsk decided to keep him around. The mist coming in off the ocean provided a dramatic backdrop to the photogenic Lenin. What you can’t see in the photos is the utter state of disrepair in the plaza. Steps and walkways were crumbling, crooked and deteriorating. After a quick stop in a souvenir shop, we stumbled across a striking sign of russia’s westernization: A brand new glistening Gold’s Gym! Newly renovated with shiny gold logos on the facade, this workout facility would have been at home in any upscale strip mall in the States. drop and give me 20 you girlie-man! For me, the highlight of this shore excursion was finding sake at a Japanese restaurant in Siberia! We stumbled across a Japanese restaurant called “Sushi Bar Kyoto”. Luckily for me, scott was able to read Cyrillic and explained to me that “ÑÐ°ÐºÑ” was actually Sake! of course I had to try it and asked for it ‘cold’. What arrived was a room temperature big box sake that lacked subtlety, but hey, I was drinking sake in Siberia, so who’s to argue. After the big sake adventure, we took our small boat back to the cruise ship and hunkered down for the evening. The trip to Petropavlovsk left me feeling so grateful for all the luxuries (and sake) I was enjoying aboard the Mariner but I did receive some memories I won’t soon forget. Tomorrow is a full day of cruising the Kuril Islands and another sake seminar! I’m hoping for calm seas and delicious sake. Sake Cruise ’09: Rockin’ Sake! I went to bed on Sept 20th, 2009 and woke up on Sept 22nd, 2009. We crossed the international date line overnight and Sept 21, 2009 just didn’t happen! I’m not quite sure how all this works and why this is done, but I’m just along for the ride and having a great time. Today was my fourth sake lecture on board for the guests of Regent Seven Seas Cruise line’s Seven Seas Mariner. Today we tackled one of my favorite topics to teach about: the Sake Production Process! How do you go from Rice and Water to “the Drink of the Gods”? That is what I endeavor to explain to guests in this lecture. This lecture was subtitled “Rockin’ Sake” because we had what has been some of the most dramatic rocking of the ship we experienced to dateâ€¦ right during my lecture! The captain came on the intercom to announce we were experiencing 20-25 foot high waves. Kind of unreal, but once I got into teaching I was able to ignore the waves and get into sake! I thought because of the rough waves, we would have a meager turn out, but we had a full class and I was just delighted! The guests loved all the sakes today! Tomorrow, there is no sake lecture as we are spending the entire day in port in Siberia, comrade! Da! https://www.urbansake.com/wp-content/uploads/2016/04/janome-logov6.png 0 0 Timothy Sullivan https://www.urbansake.com/wp-content/uploads/2016/04/janome-logov6.png Timothy Sullivan2009-09-22 20:35:112009-10-04 18:41:57Sake Cruise '09: Rockin' Sake! Today was our second full day at sea. No stops, no ports of call, sailing all day, all night. You might think that this leads to a feeling of being bored and all cooped up, but quite on the contrary, the staff organizes lots and lots of activities: games, lectures, dancing, bridge, tea, concerts, comedy, and of course, SAKE TASTINGS! Most days I’ve been visiting Faye, our friendly server at the “coffee connection”. This is a coffee bar area located mid ship on deck 6 that offers coffee, tea and snacks pretty much all day long. I’ve found myself hanging out here quite a bit as it is a comfortable place to sit and work on my presentations and lecture handouts. We also had an in-depth discussion of sake temperature. Is all hot sake bad sake?! Not by a long shot. The guest and I enjoyed a fun hour together discussing all these points. since we are on our way to Japan, there is an extra level of interest in learning about sake and there were lots of questions which I just love. Tomorrow is more cruising, more sake and crossing the international date line! Hello Tomorrow! Day 4 onboard the Seven Seas Mariner was action packed! I woke up in Dutch Harbor Alaska. This was our last day on American Soil as we would be sailing out at 1pm across the Bering strait on our 2 day voyage to Siberia. This was also my first day off the ship since boarding. Dutch Harbor was fascinating – this fishing town is best known as the home base for the crab fisherman on the Discovery Channel’s series “the Deadliest Catch”. The town itself has stunning natural beauty with mountains and inlets carved out by retreating glaciers. One of the star attractions of Dutch Harbor is the Russian Orthodox church which was first built in 1826. Photos are not allowed inside, but I had the thrill of a lifetime when I saw an American Bald Eagle land on the church spire and then leap into flight with it’s 5 food wingspan. It was breathtaking! The guest in attendance at the tasting seemed surprised to learn that Koji Mold is used in making sake and is one of the primary ingredients! We have a fun hour together and it left me looking forward to Tomorrow’s lecture which will be “how to taste sake”. Should be fun! Sake Cruise ’09: Let the Seminars Begin! Today was a big day on Sake Cruise 2009! Not only is today our first day “at sea” (i.e. no ports of call – sailing the open ocean all day) but today was also my first Sake Seminar for the Guests aboard the Seven Seas mariner as well as an informal staff training. The day started with that now familiar question in my mindâ€¦ will we have mild seas or wild seas?! I’m still a little rattled after the first night of “rock and roll” on board, but I’m delighted to report that today is easy sailing. Smooth calm seas! yeeeees! After a quick breakfast, I headed off to do a 30 min staff training on the finer points of sake. I have the wine and beverage staff of about 30 people an introduction into sake classifications, flavor profiles and also into serving sake. We were enjoying Junmai, Junmai Ginjo and Junmai Daiginjo sakes at 9:30 am. The breakfast of champions! The staff training was a lot of fun and they had many good questions. I touched on serving etiquette and serving vessels, too. We covered as much as we could to give all the beverage staff a solid foundation in sake. And we had a lot of fun, too. At 3pm, I had my first seminar for the guests of the cruise. The Seminar was held in the “Compass Rose” restaurant on board. That is the largest of all the elegant restaurants on the ship. They set up a projector for the powerpoint and we were off to the races! In this lecture, we will introduce guests to the six basic sake classifications. Learning how sakes are graded and ranked is the cornerstone to a solid understanding of sake culture and enjoyment. We will explore how the use of rice milling technology, sake ingredients and Japanese history have all come together to give us the sake grading system in place today. I think the seminar was well received and I’m looking forward to hopefully having some repeat students in tomorrow’s class which is dedicated to Sake Ingredients! https://www.urbansake.com/wp-content/uploads/2016/04/janome-logov6.png 0 0 Timothy Sullivan https://www.urbansake.com/wp-content/uploads/2016/04/janome-logov6.png Timothy Sullivan2009-09-18 21:54:132012-06-06 20:07:39Sake Cruise '09: Let the Seminars Begin! I won’t lie – last night, our first evening on board, was rough! 15 foot waves were bouncing us around and I even heard the experienced crew complaining of sea sickness. Choppy waters out the window were cresting white and loud. “Will the entire two weeks to Japan be like this?”, I couldn’t help but wonder aloud. Luckily, once I put myself in bed and let the 40 mile and hour winds rock me to sleep, I was able to drift off without too much of an issue, digestive or otherwise. Waking up this morning, I found the ship to be perfectly still and anchored off Kodiak Alaska. I headed to the balcony and looked out to find another beautiful rainbow! So far, I’ve seen more rainbows in Alaska than you see during Pride month in Chelsea! Even on my third day away from New York, I found the sea air to be shockingly fresh and the surrounding islands to be incredibly beautiful. I However, didn’t have time for excursions on shore today, as I was meeting with the food and beverage crew to discuss planning for my upcoming sake classes. I found out my lectures will be happening at 3pm on the days we are at sea (i.e. no ports of call) and held in the elegantly appointed Compass Rose Restaurant. After a few more meetings and discussions with the crew, almost all details were set. and tomorrow I start my lecture series! Last but not least, I was asked for a TV interview by Jamie Logan the Cruise Director. Jamie films a daily TV show for the “number 1 onboard TV channel” aka Channel 1 on the ship board TV. My big TV debut was broadcast across the entire ship! I’m actually on an endless loop all day. That’s a little too much Timothy air time even for me. I’m happy to report that the seas are calmer tonight and I can’t help but wonder aloud, will the entire two weeks to Japan be like this!! yea! After seemingly endless hours in the air, an overnight in Achorage and a three hour bus ride, I finally arrived at our sake cruise ship in Seward, Alaska. We’re sailing on the Seven Seas Mariner and it sure was an impressive site catching the first glimpse of the ship as we approached the dock. I’ve never been on a cruise, so this was my first time seeing a cruise ship up close. After checking in and boarding, we did a quick self guided tour of the public decks to get oriented and then it was off to watch our sailing out from the main observation lounge. The most amazing thing happened – Out of nowhere we saw a huge rainbow appear right outside our window. It was beautiful and everyone agreed it was a good sign for a great sailing. My Sake Seminars on board don’t start until day after tomorrow, so I have a chance to get my sea legs and acclimate to life onboard ship. I think I’ll need that time to get my sea legsâ€¦ as soon as we left the port at Seward, the ship was hit with 40 mph winds and strong waves. This is not what I expected but I am enjoying the adventure. https://www.urbansake.com/wp-content/uploads/2016/04/janome-logov6.png 0 0 Timothy Sullivan https://www.urbansake.com/wp-content/uploads/2016/04/janome-logov6.png Timothy Sullivan2009-09-16 20:53:332009-09-17 10:57:38Anchors Away! Join Me on a Sake Cruise to Japan! Life in New York City can really be tough sometimes. Cramped subways, runaway taxis, even malicious pigeons… It’s enough to make even the most dedicated city slicker want to escape into a day dream. Thinking about some of the wonderful, exotic and relaxing escapes life has to offer can really soothe the soul. For example, have you ever dreamed about being pampered on a luxurious two week getaway cruise? Oh yeah. Or maybe you’ve thought about attending a professional sake tasting seminar to enjoy some of the very best sake on earth? Yes! Or how about meditating in an ancient Japanese shrine? Check! Well, if any of this sounds good, you’re in luck! You can do all three at once this September! Departing Sept 16th, 2009 you can join me aboard the Seven Seas Mariner, as we take a two week trip of a lifetime, sailing from Alaska to four ports of call in Japan. On board, I’ll be leading a series of six in-depth sake tasting seminars as we sample some of the very best sakes in the world. Cruise Ship + Japan + Sake = Heaven! https://www.urbansake.com/wp-content/uploads/2016/04/janome-logov6.png 0 0 Timothy Sullivan https://www.urbansake.com/wp-content/uploads/2016/04/janome-logov6.png Timothy Sullivan2009-08-27 17:32:272009-09-14 21:10:30Join Me on a Sake Cruise to Japan!